You may notice that every time you open a workbook that contains macros, Excel asks you if you want to enable the macros. This is part of the security system built into Excel. (This system has saved my bacon on more than one occasion.) You may also have noticed that if you delete all the macros in your workbook, Excel still asks you if you want to enable macros when you later open the workbook. Why would Excel do this? After all, you deleted all the macros in the workbook, right? The reason is that the module automatically created by Excel to hold your macros is not automatically deleted when you get rid of the last macro—it’s still there. As long as the module is there, Excel will dutifully ask you if you want to enable your macros whenever you load the workbook. 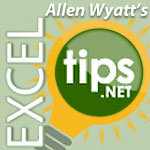 Excel Tips excel, exceltips, macros, vba, workbook. permalink.